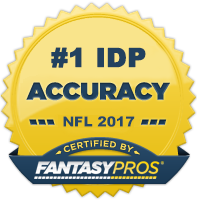 PLEASE NOTE THAT SINCE MOST FANTASY LEAGUES END WEEK 16, THIS WILL BE THE FINAL IDP WAIVER WIRE PICKUPS ARTICLE FOR THE 2017 FANTASY SEASON. IF YOUR LEAGUE PLAYS THROUGH WEEK 17, FEEL FREE TO REACH OUT TO ME PERSONALLY TO ASK FOR SPECIFIC LINEUP ADVICE FOR THE WEEK. Mark Barron left with a knee injury this past Sunday after just three snaps. Cory Littleton took his spot and played every-down for the remainder of the game but failed to produce much. If Barron were to miss time, owners should bump up Alec Ogletree fairly significantly. Denzel Perryman is suffering from a tendon strain in his hamstring and will almost certainly miss this week's game and could be shut down for the rest of the regular season. The 36-year old Karlos Dansby injured his calf in last week's game and was forced from the game. Josh Bynes filled in for him but suffered an injury of his own. If neither player were able to suit up this week, the Cardinals could mix in both Scooby Wright and Haason Reddick at inside linebacker. Jon Bostic suffered a knee injury in the second half of the Colts' Thursday Night matchup against the Broncos. He was placed on injured reserve a few days later. Rookie Anthony Walker will take his spot in the starting lineup and will be auditioning for a larger role in 2018. Anthony Hitchens injured his knee mid-way through the Sunday Night game and did not return. The Cowboys sounded optimistic that he could suit up next week in a must-win game against the Seahawks, however. Keep in mind that despite Hitchens' recent production, he's not a full-time player as Jaylon Smith steals away some snaps on occasion. E.J. Gaines injured his knee in the Bills win over the Dolphins. The severity of the injury is not yet known. We should have more details over the next couple of days. Leonard Johnson would likely see the bulk of snaps at corner if Gaines were to sit out. All-Pro safety Landon Collins looked very questionable to play heading into Week 15; however, he decided to play (a strange decision for a team well out of contention). He lasted just 18 defensive plays before aggravating his ankle injury. I would expect the Giants to shut him down for the remainder of the year. Muhammad Wilkerson was a healthy scratch in Week 15 for once again being late to team meetings. When asked about his status for this week, Head Coach Todd Bowles was non-committal. It's best to assume he's not going to play for the remainder of the season at this point. Bobby Wagner was active last week but eventually pulled himself from the game in the third quarter. The game was out of hand by that point so he was just being cautious and didn't actually occur a setback of any sort. Terrence Garvin played every down for the injured K.J. Wright. After playing 100% of the defensive plays through his first seven games, Lawrence Timmons has seen his snaps counts take a hit over the last month as he's losing playing time to youngster Stephone Anthony. Obviously, the Dolphins don't see Timmons as the long-term solution at the position and are seeing what they have in Anthony. It's a situation to keep an eye given that Anthony showed some LB1 potential early in his career with New Orleans. Jake Ryan was active last week but only saw special teams duties. Instead it was Joe Thomas who saw the vast majority of playing time at inside linebacker next to Blake Martinez. Thomas is a better coverage linebacker than Ryan so this could have been a one-game only thing to try and slow down Christian McCaffrey. So I wouldn't read too much into this situation. B.J. Goodson returned to the starting lineup but split snaps with Calvin Munson at middle linebacker. Kelvin Sheppard remains the closest thing the Giants have to an every-down linebacker, playing in 78% of the defensive snaps this week. Both Manti Te'o and Craig Robertson played 90% of the defensive snaps with A.J. Klein inactive last week. Vonn Bell has been one of fantasy's biggest boom/bust safeties this season. Now with the Saints secondary getting healthy, Bell is being squeezed out in terms of playing time. He saw just 18 snaps last week and consequently generated just two solo tackles. He's a player that can be dumped in re-draft leagues. DE/LB Matt Judon (BAL) - Judon, Grand Valley State's all-time sack leader, continues to impress for the Ravens. He's now up to a 45-10-7 stat line for the season and has the most sackable team on the league on the schedule next with the Indianapolis Colts. Consider him a must start if he's classified as a defensive lineman in your league and a LB4+/LB3- if he's a linebacker. DE Anthony Lanier (WAS) - Lanier didn't see much playing time at all until about halfway through the season. Things finally seem to be clicking for him though as he's had five sacks over his last four games. Plus, he has a very nice matchup against the Broncos who are among the league's worst in terms of protecting their quarterback. Lanier's got a solid shot at extending his sack streak to three straight games this week. DT Lawrence Guy (NE) - Guy is someone to really only consider if you are in a deep, DT-required IDP league. He's seen a decent bump in playing time over the last two weeks (by around ~20%) which has helped him produce stat lines of 4-1, PD and 4-3-1, respectively. He has a top 6 matchup against the Bills this week so I could see 5-6 total tackles and a 30-35% chance of a sack. ILB Antonio Morrison (IND) - Morrison has a respectable 95 total tackles (40 assists) through 13 games but wasn't an every-down linebacker and often played second fiddle to teammate Jon Bostic in terms of weekly tackle production. With Bostic now on injured reserve, expect Morrison to take on a full-time role and become the team's leading tackler (like he was last week with Bostic leaving early with an injury). His matchup against the Ravens, who give up the second most points to opposing linebackers, couldn't have come at a better time for fantasy owners. He's a great Week 16 add for those looking to the waiver wire to help secure a IDP fantasy football championship. ILB Jatavis Brown (SD) - Brown was an IDP darling of many heading into 2017 based on several monster performances the season prior. However, he's snaps had dwindled to next to nothing as this season has progressed as the team opted to go with Denzel Perryman and safety Adrian Phillips at middle and weak side linebacker, respectively. With Perryman injured and likely out for this week, Brown should get first shot at the bulk of Perryman's snaps. He registered 8 total tackles on just 33 snaps last week and could be in for a big game to end the fantasy football regular season. The Chargers could always opt to rotate Hayes Pullard and/or Korey Toomer into the position as well, so there's some risk with this pickup. But for those underdogs in need of big points, Brown presents us with a nice boom/bust option. ILB Zach Vigil (WAS) - I mentioned Vigil as a solid waiver wire pickup last week and he came through with 8 total tackles (6 solos) and 2 pass deflections. He's still available in a lot of leagues and has an above average matchup against the Broncos this week (top 12). I would expect a similar stat line to last week. ILB Nick Kwaitkoski (CHI) - Kwaitkoski seemed like the odd man out of the Bears inside linebacker rotation just a few weeks ago. However, his playing time has increased to over 80%+ the last two weeks with the team seeming to now favor him over Christian Jones at LILB. He had 8 total tackles last week and has a top 5 matchup against the Browns on the slate this week. OLB Kendell Beckwith (TB) - If Lavonte David misses another game with his hamstring injury, Beckwith becomes an intriguing end-of-season, streaming option for those in deep IDP leagues. He's shown to be productive when given a full-time role and the Bucs could be without a lot of their typical starters on defense, heavily decreasing the tackle opportunity for Beckwith. The matchup against Carolina isn't great though, so I have to temper expectations for Beckwith down to a LB3- level even if David remains out. S Andrew Adams (NYG) - I think it's highly likely the Giants shut down Landon Collins for the season after he aggravated his ankle injury last week. This would mean Andrew Adams slides into the starting safety role. He put up six solo tackles in Week 15 despite only playing 75% or so of the snaps and has a very good matchup against the Cardinals this week. This makes him a solid DB3 play. S Adrian Phillips (LAC) - As I've been mentioning over the last several weeks, the Chargers have been using Phillips at linebacker instead of his typical safety role. He led the team in solo tackles with eight last week. His production may have been helped with Denzel Perryman out of the lineup. With Perryman expected to miss this week, Phillips should make for a relatively, high floor safety option. CB Ronald Darby (PHI) - Darby has been very good since returning to the starting lineup in Week 11. He's registered 5 or more solo tackles in four of those five games to go along with 2 interceptions and 7 pass deflections. He has an average matchup against the Raiders this week but David Carr has been struggling as of late, so I can see Darby continuing his streak of CB1/CB1- performances. CB Leonard Johnson (BUF) - Leonard Johnson could prove a sneaky play this week for those in CB-required leagues IF E.J. Gaines is inactive. Johnson filled in for the injured Gaines last week and posted eight solo tackles while guarding Jarvis Landry. I would expect the Patriots to attack him if he starts in Week 16 which should result in ample tackle opportunity for the six-year veteran out of Iowa State.